But David said to Saul, “Your servant was tending his father’s sheep. When a lion or a bear came and took a lamb from the flock, I went out after him and attacked him, and rescued it from his mouth; and when he rose up against me, I seized him by his beard and struck him and killed him. Thus David prevailed over the Philistine with a sling and a stone, and he struck the Philistine and killed him; but there was no sword in David’s hand. Take a close look at this story. 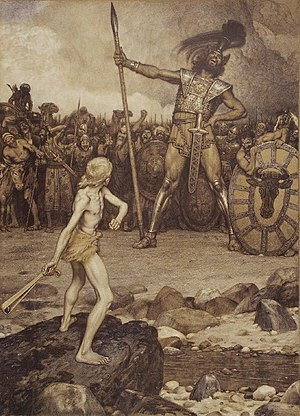 David was so sure of his faith in God that he could disobey King Saul’s order not to go against the Philistine. David had life experiences with lions and bears and had known God’s protection. David’s courage came directly from God Himself because He knew his heart. David knew God and knew God’s will in this situation would be done. Basically, David never took his eyes off God during the battle. There was a problem (later in his life) only when he chose to see through eyes that were selfish and sinful. Faith is keeping our eyes on God, and staying open and aware of His desires, even when we don’t think He’s looking. He’s always looking…He never Blinks. Heavenly Father give me faith and courage like David’s. Let me keep my eyes on You at all times. Make it so, Lord! This entry was posted in Faith, Fellowship with God, Old Testament and tagged Courage, David, faith, Goliath, Philistine, Saul by Marie. Bookmark the permalink. Spiritsisters that was so good ,that so familiar story,but reinforcing Gods truths again , I like what you said:even when we don’t think He’s looking. He’s always looking…He never Blinks. In the work situation its called ,integrity. giving 100% to your boss even when you know he isn`t there. What a great devotional for today! Yes, David did go through a dark time when he allowed selfishness and lust to govern is actions, but I always find it encouraging that God was waiting with forgiveness when David turned back to God. I am unlikely to be as great as David, but I’m just as loved and forgiven. So true. Wouldn’t it be great if we were all known as ‘a man after God’s own heart’. Enjoyed your post and your thoughts.